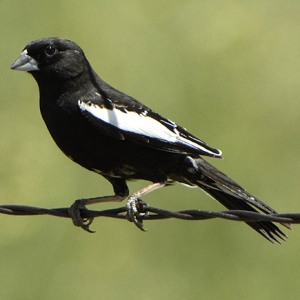 Many species of grassland birds unique to the western Great Plains—such as Colorado’s state bird, the Lark Bunting—are in steep decline. What appears to be a small decline of 3% per year will amount to a loss of more than half of the Lark Bunting population over a 17-year period, and this is happening to most shortgrass prairie dependent birds. To better understand the causes of these declines, managers need information about the distribution, abundance, and habitat that these species use across their range. This information helps conservation partners understand how to best manage wildlife populations and where to target conservation actions to arrest or reverse declines. In 2015, PLJV began working with many partners, including our management board, to implement the Integrated Monitoring in Bird Conservation Regions (IMBCR) program across our six states. This program provides much-needed, scientifically defensible estimates of bird distribution and abundance across large areas that will be used to target and evaluate habitat projects throughout the region. The important work of data collection is executed by Bird Conservancy of the Rockies, while GIS modeling of field data is done right here at PLJV. The IMBCR data allows us to create distribution maps and population estimates useful in all aspects of bird conservation; habitat models that provide information needed to guide conservation efforts and habitat management; and GIS data that can be paired with bird data to guide landscape-level planning. During the 2016 field season, 220 bird species were detected in the PLJV region, of which 130 are on a list of birds PLJV tracks due to declining or unknown population trends. There were 18 species for which we can complete density and occupancy estimates and 12 additional species for which we can complete occupancy estimates. PLJV staff are now working with our partners to identify common research questions such as grassland bird response to the spread of invasive species and woody encroachment and habitat management for game birds. “Our goal is to leverage IMBCR for PLJV’s data and our regional partnership to identify common themes in management questions, to demonstrate how IMBCR bird data can be used to inform adaptive management around those questions, and to work with partners across state lines to conserve birds,” says GIS Analyst Kyle Taylor, who is conducting the modeling. Program funding for the first two years (2016-2017) of IMBCR for PLJV is provided by regional and national partners, including Colorado Parks & Wildlife, Kansas Dept. of Wildlife, Parks & Tourism, Nebraska Game & Parks Commission, New Mexico Dept. of Game & Fish, Oklahoma Dept. of Wildlife Conservation, Texas Parks & Wildlife Dept., USDA Farm Service Agency, USDA Forest Service, and Great Plains Landscape Conservation Cooperative (US Fish & Wildlife Service, USFWS). The Migratory Bird Program (Southwest Region, USFWS) also provides funding to support PLJV’s work on this program. Photo of Lark Bunting courtesy of Bill Schmoker.